Lynnville-Sully’s Josh Dunsbergen ended his high school wrestling career competing with the best of the best at the Iowa High School State Wrestling Champion-ships last week. 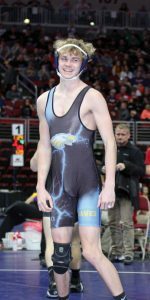 The 138-pound senior and only Hawk to qualify for state this year finished with a 1-2 record at Wells Fargo Arena in Des Moines. Dunsbergen, who also qualified for state as a freshman, went into the tournament seeded 16th. In his first match on Thursday, Feb. 15, he fell to Kolton Roth of Graettinger-Terril/Ruthven-Ayrshire by a 15-0 technical fall. Roth went on to take second in the tournament. Dunsbergen is all smiles after earning a pin at state. Later that day, Dunsbergen bounced back in his second match, quickly pinning Austin Gutknecht of Clarinda in 25 seconds. As a freshman, Dunsbergen’s goal was to make it on to a second day of competition at state. That dream came true this year as he advanced to the second- round consolations on Friday, Feb. 16. Dunsbergen’s state exper-ience and high school wrestling career came to a close earlier than he wanted that day when he suffered an 8-4 loss to Mitchell Paca of Sibley-Ocheyedan. Paca went on to place eighth in the tournament. "Things didn't quite go the way we wanted them to, but I'm still glad I could compete at the state tournament one last time,” Dunsbergen said. “It felt good to end my career with the best wrestlers in the state." Dunsbergen finishes the season with a record of 37-6. He is the son of Dustin and Dana Dunsbergen of Lynnville. 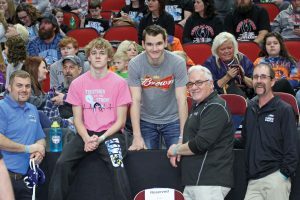 Among Josh Dunsbergen’s (pink shirt) supporters at state are, standing in front, Assistant Coach Billy Cupples, Assistant Coach Tom Pool, and Head Coach Jason Walston, as well as a fellow senior wrestler, Cayden Johnson (gray shirt).